Minute to Win It Board Game: Bring the hit NBC game show, Minute To Win It, off the television and right into your living room. This deluxe version of the game includes cards with simple, hilarious and nerve-wrecking tasks players need to complete in under a minute. Mix and match the included props; like a banana, string and ping pong balls, along with everyday household items to win it. 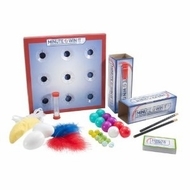 Includes 300 challenge cards, plastic balls, feathers, foam eggs, cotton handkerchief, sand timer, pedometer, elastic head band, plastic banana, hoop and more.